For over forty years, the Babe Ruth Birthplace Foundation has been committed to preserving, interpreting and celebrating our state’s sports heritage. We have welcomed millions of visitors, launched exciting educational programs, expanded the collection and become a leader in the field of sports heritage. Babe Ruth’s Birthplace is celebrated as a national treasure. Sports have helped shape the identity of our community and, for many of us, impacted our lives. The Babe Ruth Birthplace Foundation preserves and chronicles the unique stories from Maryland’s championship sports heritage. We hope you will join our team by supporting the Foundation’s mission to educate and safeguard the role sports play in sustaining our civic pride and uniting generations. Your support makes these efforts, and many others, possible. Your tax-deductible gift is extremely important because it allows us to continue to preserve and interpret our important sports heritage. 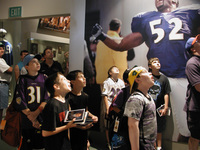 The Babe Ruth Birthplace Foundation, Inc. is an independent, not-for-profit educational institution dedicated to perpetuating the historic legacy of Babe Ruth, Baltimore’s Orioles and Colts, and local and regional sports at the amateur, collegiate and professional levels, by preserving, exhibiting, interpreting and augmenting its collections for a diverse audience. The Babe Ruth Birthplace Foundation relies on community support to sustain its programs, activities, and operations, and welcomes contributions and grants from individuals, families, foundations, and corporations. For more information on making a contribution, or to inquire about corporate sponsorship opportunities, please contact Shawn Herne, Executive Director. To learn more about becoming a member of the Babe Ruth Birthplace Museum, click HERE. 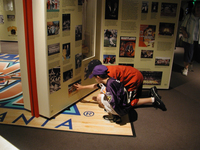 The Babe Ruth Museum collects game-used equipment and ephemera related to Babe Ruth, the Baltimore Orioles, the Baltimore Colts and Ravens, Johnny Unitas, the Baltimore Blast, Memorial Stadium and other sports entities in the state of Maryland. Our collection of artifacts, photographs and archival material is a result of generous donations by athletes, teams, collectors and fans. The Babe Ruth Museum welcomes donations of items related to our mission.